Since I went to MAGFest this year, I've been kind of obsessed with the idea of making retro development easier. The people I met made me realize that a lot of people want to get started, but aren't sure how. While there are a lot of good options out there already, I realized there just might be a space for a code-based starter kit. So, I made one! All changes can be done in C - no lower-level coding is required. The thing can be used to build a very simple, basic game without much code. However, the included guide walks you through adding a lot of features, and also hopefully gives enough guidance to come up with your own ideas! Engine performance could get slow when features are added. I don't know if I've quite found the balance between performance and ease-of-use yet. The guide is broken into 5 sections - the first one is an introduction, and the rest are meant to be read as needed. Last edited by cppchriscpp on Thu Aug 30, 2018 8:37 pm, edited 4 times in total. I think it's awesome that you made this. I imagine most of the people that inhabit this forum will say that we wouldn't use it, because if we're here, chances are we are no longer your target audience. But I can see this being extremely useful for someone wanting an example to get started with. So I guess my point is, I hope you don't be discouraged by a lot of "I won't use it" responses here, because I love that you made this. Thanks for the feedback - that's a good point. 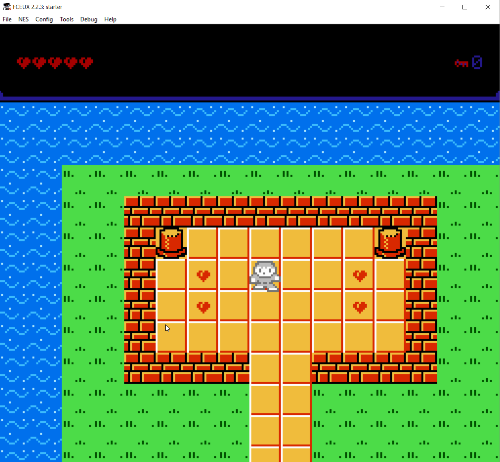 I guess with NESDev I'm not really expecting much in terms of "I'd use this" -- I almost didn't post here, but I think there's more of a chance that people here will look at it with a critical eye, and point out potential problems. That's valuable too! We get people here every couple months who want to do NES stuff in C and not assembly (though I tend to remind them: you're going to have to deal with 6502 eventually, esp. when debugging, so avoiding it entirely is unlikely). So the fact your project is predominantly in C (barring the deeper bits, which you covered already in a smaller font) should make that process easier for those folks. Nice work! I'm in the process of finishing something simmilar (a simple, modular and configurable game engine, along with a toolchain and tutorials), also using C, neslib and famitracker. Some knowledge of C is good to have for full customization, but it should be manageable for a non programmer as well. What is your target audience? Thanks for the feedback Koitsu! na_th_an- That's awesome; I'll be super interested to see your project when it's ready. You've consistently produced amazing work, so I'm going to bet it will be good. For a target audience, the ideal person is a developer who has thus far only worked in higher-level languages (thinking node/php/java/etc) and wants to dive into NES dev, but needs some guidance/hand-holding. I'm also trying to make it accessible to the person who has only written a few scripts here-and-there... but I realize that's going to be harder to do, and I don't think I've gotten close to that target yet. I guess for me, a big thing *I* like to play with is game mechanics, so one of my goals is to make changing those really clear/easy. I like how you have organized things and have learned a couple of things that will save me from lots of manual work when configuring fairly complex mappers. I have yet to examine the code, which I will. I guess, from a quick glance, you are interested mainly in code readability and make things easy for programmers, which is a good thing. Code is clean cut. I'm sure newcomers will have a great quickstart. The empty canvas is frightening if it's your first canvas. I believe in a way of learning to do things where you start filling in the gaps. For instance I can readily write 6502 assembly after all these years and such an asset has helped me in making my games better - but if I had to have endured the hard way, I'm sure I'd given up. Hadn't I had neslib and Chase I would have achieved nothing. And what you are offering is vastly superior! I wouldn't use it though. But that's simply because doing the low level stuff myself on the nes is part of the fun for me. I am super new to nesdev, and I am very happy to devour anything you are offering. Thank you! Just a quick update; I've got the first two sections complete, and with those you should be capable of making a very basic game! I'm kinda thinking of this like an alpha release. At any rate, progress continues! It's been about a month, so I figured I'd post an update. The project is quite alive! Since my last post I've completed about 80% of the chapters I had intended to write. (I have around 9 left, though I may add/subtract a few) It's definitely ready for use now! I also just released a documentation site today: Pretty documentation! Anyway enjoy, and questions are always welcome! Your guide says you need Cygwin, so I'm thinking hmm, is he compiling a NES game with GCC? But then the source code is cc65 and neslib...which I didn't see mentioned at all in the guide. What is Cygwin for then, just to get the Unix tools? Not for a C compiler? Yep, it's just to get the unix tools. Mainly, I want make (to put all build stuff in one place, allow incremental builds, and organize it in a semi-sane way), as well as curl/rm/mkdir/touch/etc. Could I do all of this with windows commands? Sure, but I suspect it'd be harder to edit and understand, and also more prone to failure. That aside, you do make an interesting point about what tools are mentioned where. Still thinking about if I want to do more. In the setup instructions included with nrom-template, I have recommended getting the UNIX tools (Make, Bash, and Coreutils) on Windows by installing MSYS 2 through devkitPro Updater. Would MSYS be a good substitute for Cygwin in this case? Git for Windows also includes MSYS Bash and Coreutils, but in that distribution Make needs to be installed separately from ezwinports. I could potentially do that, but I'm not really sure what benefit anyone would get from it. Could you elaborate? Cygwin is a little old/clunky, but it 1) provides the tools I need, and 2) provides a convenient installer for them with command line parameters, so I can make it really easy for someone to install the tools and move on. (Plus, if you have Cygwin already installed it will just add anything you don't already have) I looked at a couple options, and cygwin actually seemed like the easiest to support/use. I can certainly be convinced, but it seems counter-intuitive to change right now.